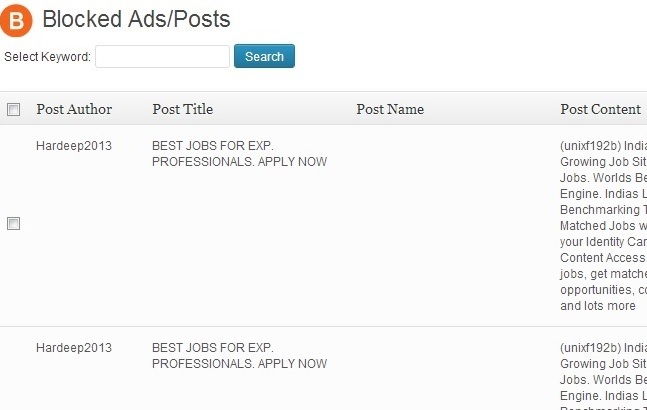 AdPoster Blocker is a simple but powerful plugin which blocks new user registrations or new ads/jobs/posts based on the string identified by the website admin. 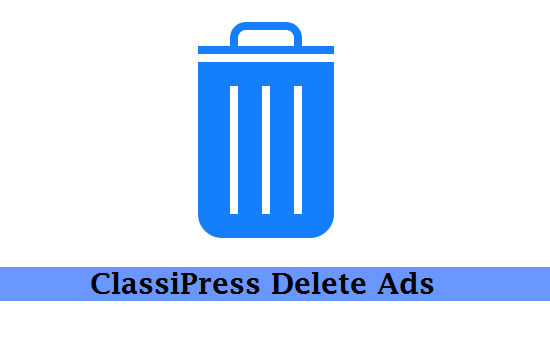 The requirement of this plugin came when a lot of ad posters (link builders) started posting irrelevant ads on my ClassiPress website. These spammy AdPosters had a pattern, either they use similar email address for user registration (email ids containing their company name) or they will have a similar identification code in all their ad posts. 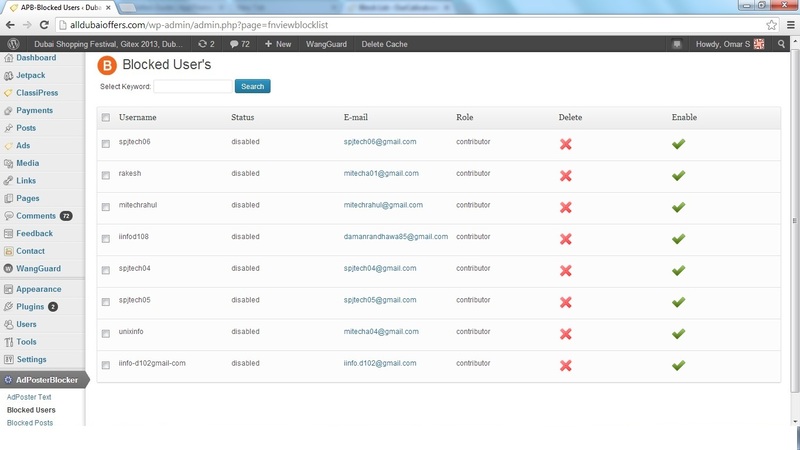 This plugin allows admins to store the email id pattern or the code they enter in their ad posts. Then when any new user registers with username/email similar to the string saved by the admin, the new registrant gets disabled automatically. For example, the admin saves the string ‘iinfo’, then if a new user registers with email ‘iinfo456@gmail.com’ or username ‘iinfo_rt’, the user automatically gets disabled. Similarly for posts/ads, if the admin saves a string ‘Unixad’, then if any user posts an ad/blog post which contains the string ‘unixad’ (not case sensitive) then the ad/post is automatically send to the trash. A page is given for admins to enter a string for usernames and posts separately. 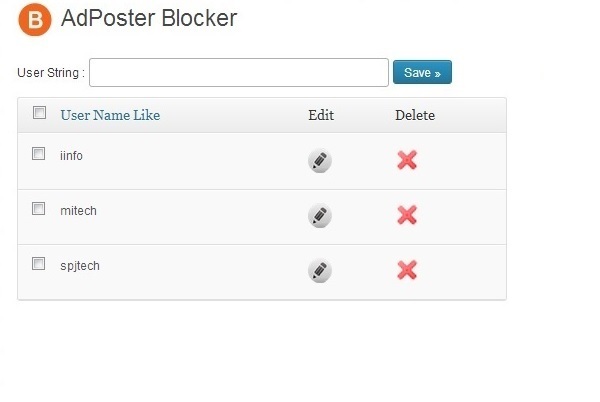 Similarly admins can see the blocked users and blocked posts and take action on it. This plugin is compatible with all AppThemes and any WordPress website. It also supports WordPress Multisite. Q) Does it work with all AppThemes themes? A) Yes it works with any website running wordpress. Q) Does it complicate User registration process? A) Not at all. There is no change in user registration process, this plugin validates when a new User registers. 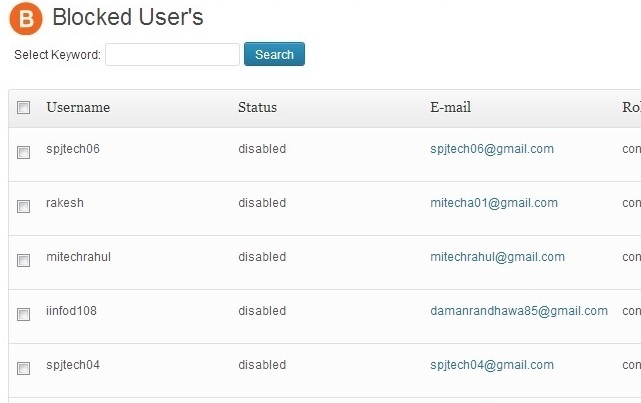 If the new user name or user email contain a string identified by website admin then the new User is disabled automatically. 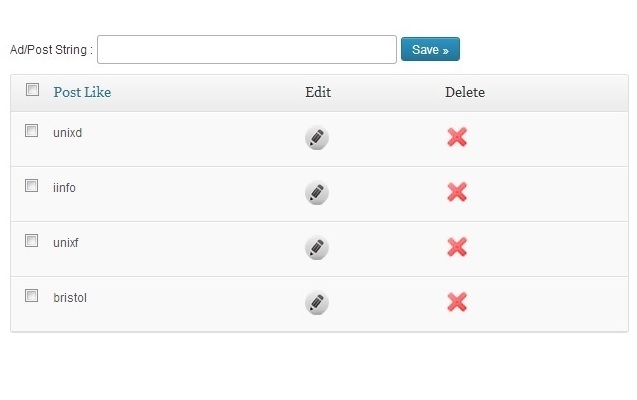 Admin has an option to enable the User if required. 1. Follow standard WordPress plugin installation. 3. A new tab AdPosterBlocker will be added. 4. 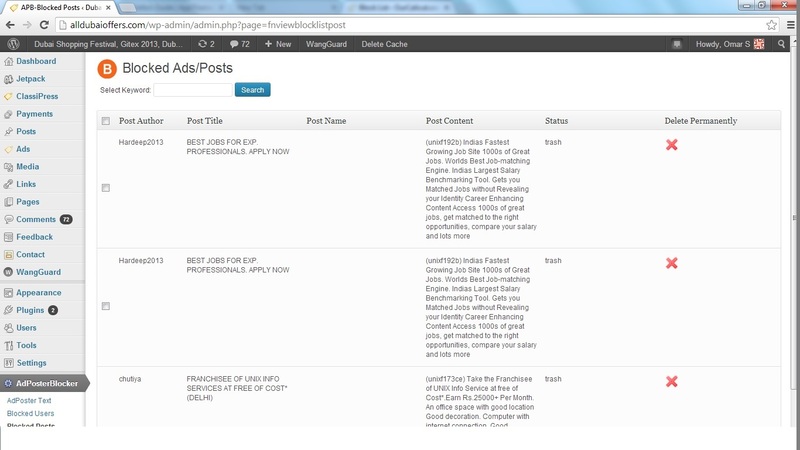 In the ‘AdPoster Text’ page website admin can enter the string for which the User or Post has to be blocked. Better UI with Search, sort and paging options. Ads will get filtered before Admin Review. 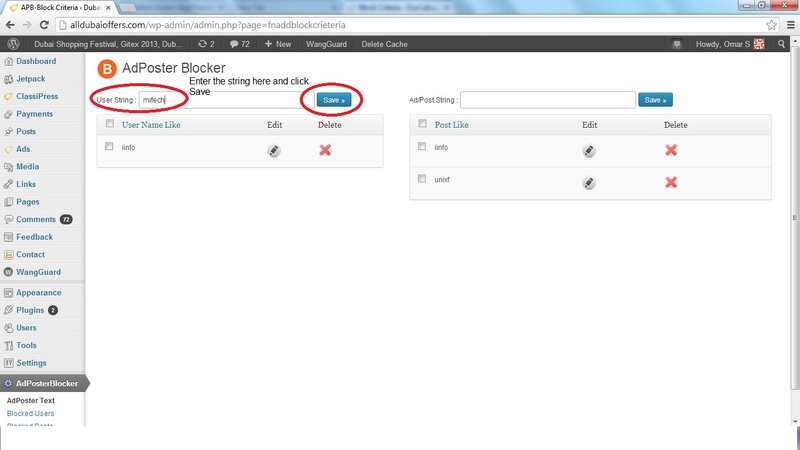 When a User posts an Ad which is blocked by the plugin, user will receive an Alert notification. I have been using this plugin for a month and it helps significantly reduce the spam posts. it works exactly as described. 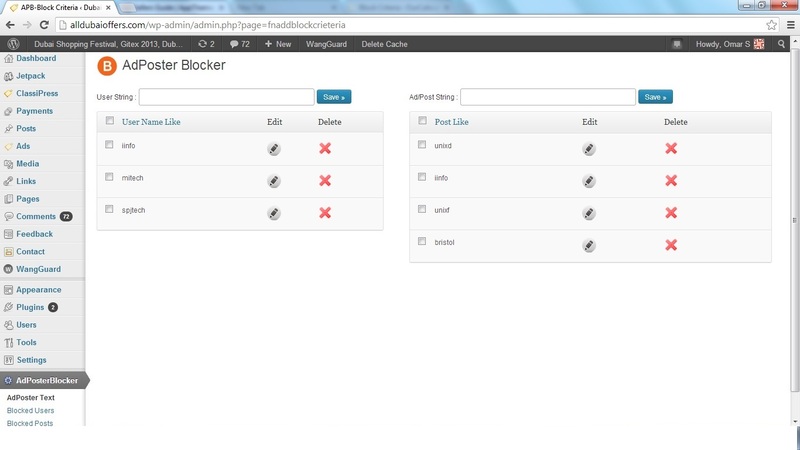 This plugin is perfect to protect any website based on wordpress. for many years I dreamed to stop spammer . now the dream become true. its easy to use and work fine. I like this plugin. It is the right plugin to stop spammers. Few last days i have searched for a plugin on other wordpress marketplaces and accidently got this link in my searches. What to say. It works as described. What i need is only one more option: To disable ads and adposters that have pass the check when i found it and enter it in the interface. Five stars. Hi, is it compatible with classipress 4+? Thank you for your time. In my site the plugin don’t go. 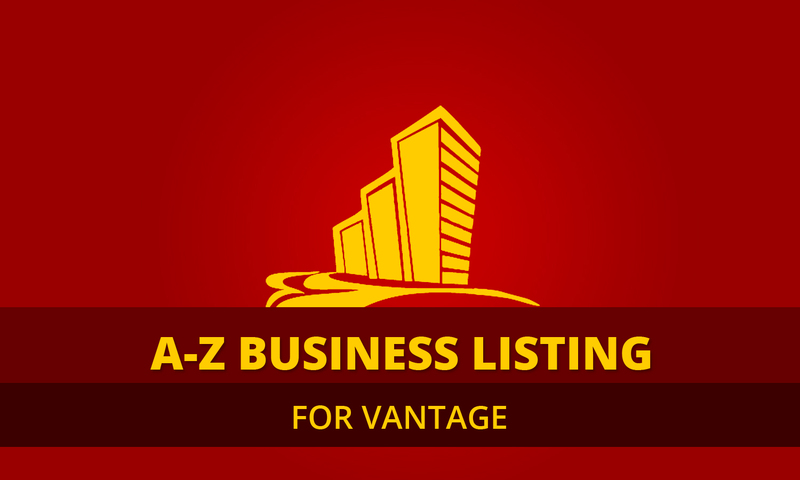 Inserts an ad category list bar via a simple shortcode.